Friends of the Earth (FoE) describe themselves as the “world’s largest grassroots environmental network, uniting 76 national member groups and some 5,000 local activist groups on every continent.” Based on this, will any members of your group be attending the Paris Climate Conference? There will be a huge number of people, at least several hundred. At events like this, we try to have a number of delegates from the global south and locals. We tend to have most of the delegates from the local area. As this will be held in Europe, they will mostly be from there. Ideally, what are the changes FoE want to see at the summit? Why are these changes so important? In tracking the debate over the last 20 years, it is clear that the issue of equity has come and gone. The Kyoto Protocol was was based on the notion of equity, yet this was lost in the 2000s as the US and its allies dominated the debate, which lead to a rise in particular voices, who were not open to there being any limits on overall carbon use. We want the concept of ‘fair shares’ at the core of any agreement in Paris. This will mean commitments for meaningful money on the table from the global north to the south and agreements to limit carbon production and hence limit warming. Within the UN, we want to see a binding treaty to control the behaviour of transnational corporations. How will the decisions at the conference affect Australia and the wider community? If we look globally, Australia has been a real climate change villain for most of the past 15 years. We are one of the largest per capita greenhouse gas emitters, and we need to reduce emissions here. We must stop exporting coal. We must listen to our regional neighbours, especially those in the Pacific. We want to encourage our government to play a key role in reaching an agreement which will hold overall warming to a maximum of 2°C. In a news report on your website, an article you posted said that that the final preparation sessions for the Paris global climate summit in Bonn, Germany last month were disappointing. It talks about a weak negotiation text favouring developed countries. Can you talk more about this please? We need to have a conversation about the loss and damage mechanism. The crux of climate change is two things. 1. The need to understand there are ecological limits. This means there are limits on allowable carbon pollution, with implication for how economies can develop. This awareness is lacking in the negotiations. 2. The right to develop conversation. The global north has used a lot of the available carbon budget to develop their economies. The south must be allowed the same right. But as a global community we need to do this in a way that doesn’t burn us all off the planet. What are the main issues you are facing with completing these objectives in Australia? For international negotiations, there is a much higher target that we must commit to: to the order of 60-70% by 2030. It is ‘up to’ 30 per cent at present, which is less than half of what’s required. In Australia, we support and help implement a ‘loss and compensation’ mechanism at a global scale, which means direct financial payments and support with adaptation and mitigation in southern nations. On the domestic level, we need to transform away from coal and liquid and natural gas. This won’t happen at the climate summit but is a required step if we are to fulfill our global responsibilities. What happens if these changes are not made? There will be continued incremental climate disruption. We’ve seen the changes – the shifts in cyclone activity, stronger el nino cycles, sea level rise, etc. We are heading towards an ecosystem collapse within conceivable time. Given this reality, failure is not a heartening option. Even with political will, (limiting temperature rises to) two degrees is going to be very hard. 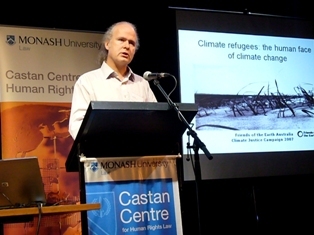 How can the UN climate change summit help get FoE’s voice heard in Australia? Fossil fuel projects are being resisted across the planet by communities and towns one by one. It is up to the leaders of the nations that will gather in Paris to listen to climate science and achieve a binding agreement to limit emissions. It’s an opportunity we can’t ignore. We have to work as strategically as possible. We are working with civil society organisations, lobbying nations from the global north, and also collaborating with important voices amongst the emerging nations to help ensure their voices are heard.